Making Thanksgiving dinner can be stressful, but it doesn’t have to be. I won’t lie, the first time I made Thanksgiving dinner I was living across the country and attacking this one my own. I must’ve called my mom every half hour to ask “what’s next?!”. As nervous as I was, everything turned out great. A little preparation, timing, good company and a couple bottles of wine (uh duh!) was all I needed to survive. 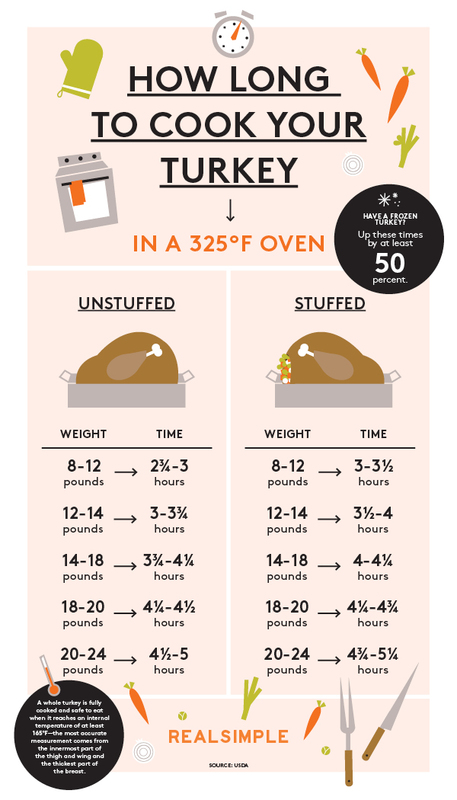 Picking the turkey size is crucial. You don’t want to buy too little, and well, buying too big is never a bad thing – one word: leftovers! The general rule is to plan for 1 ½ lbs per person. If your turkey is frozen, make sure that you safely defrost it before cooking. Thaw turkey in unopened packaging in a pan in the refrigerator. Allow 4 hours per pound to thaw. Cooking a turkey takes time, but to be honest, the oven does all the work. Just remember to baste the turkey every 45 minutes to make sure it doesn’t dry out. Preparation! Preparation! Preparation! I can’t stress this enough! While your turkey is in the oven and cooking, it’s a perfect time to get all your side dishes prepped, assembled and ready to go. That way when time comes to start cooking them, everything will be set. Timing – to make sure everything is ready at the same time, set a schedule of when things needs to start cooking. Obviously the turkey will take the longest, so base your schedule on the turkey cook time.